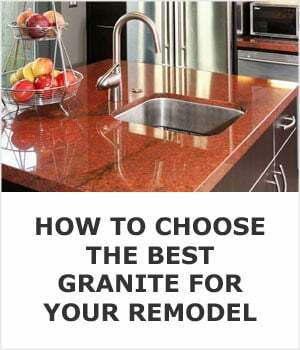 Do you have a burning desire for new countertops but can’t decide between granite and quartz? It may seem like an impossible choice. After all, both come in a gorgeous selection of colors and patterns and both make an incredibly durable work surfaces. However, if you talk to the real experts, the fabricators, most will be quick to tell you granite is a better choice than quartz. While it’s true that both are durable, it depends on the kind of abuse you throw at the two materials. Most of us do and on a daily basis we are cutting, handling hot pots and pans, moving heavy mixing bowls, and using small appliances like stand mixers and crockpots. You need to compare how each material holds up to accidents and flat out abuse. Granite is formed in intense heat and is naturally impervious to high temperatures. Hot pots and pans won’t damage the surface, though they may damage any sealant on them. Quartz, on the other hand, isn’t nearly as heat resistant. Even Silestone, the best selling engineered stone manufacturer in the world tells you to never place hot objects on their product. This quote: “It is always recommended to use a hot pad or trivet when placing hot objects on the surface” comes directly from this page on their website. The resins used to give it flexibility and shape will warp and melt under high temperatures. Low quality brands have been known to discolor under crock pots and electric skillets, so if you want put hot pans directly on the counter, cross quartz off your list. The same resin that makes quartz susceptible to damage from heat also makes it more likely to scratch. While it’s not easily scratched under normal use, it’s definitely more likely than granite to see scratches from dropped pans or slipping knives. Granite, the tough, rugged stone that it is, can handle you cutting vegetable directly on its’ surface. It’s so durable that it will actually dull your knives so invest in a wood cutting block. Accidents happen–dishes fall out of cabinets, kids drop things on countertops, adults aren’t much better. If you drop a heavy pot on granite or whack a corner with a heavy ceramic bowl, it’s more likely to chip than quartz. 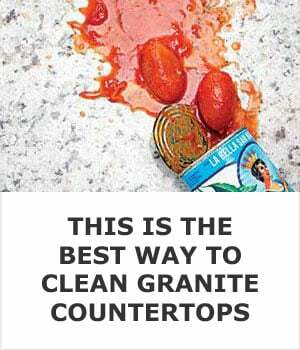 The problem is that those chips are notoriously hard to repair, but granite is fairly easy to fix and you can probably do it yourself. It’s so simple to do they sell granite repair kits at nearly every big box home improvement store. You can use similar kits with quartz but the repairs are usually more noticeable and hard to polish out. If granite has a weakness, it’s the fact that it is susceptible to stains because of its composition. Because it’s a natural stone some varities can be porous, and stains can be a real possibility unless you take 10 minutes out of your day to seal it once or twice a year. Because of the man-made resin that is used to glue quartzt together it is non-porous, so it’s stain resistant (not stain proof) and super-low maintenance. 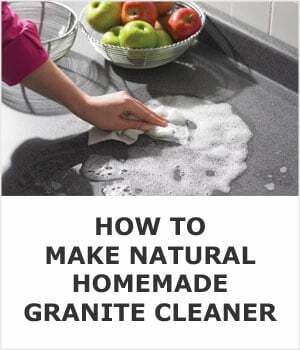 Before you assume that this makes quartz superior to granite, consider the very reason it’s non-porous. Remember how it’s made of a resin-stone mix? The same resin that makes it low maintenance also increases its risk of damage and discoloration from the heat of your pots and pans. Maybe you think that the ratio of resin to natural stone is trivial? Consider this. The manufacturers claim their slabs contain about 7% resin. What they gloss over is that the ratio is by weight. The actual volume of resin makes up about 30% to 40% of the finished product. It's almost appropriate to call them resin countertops instead of quartz. Sure, sealing stone a couple of times per year is a hassle, but a melted countertop from forgetting to use a trivet under a hot pan is a nightmare. 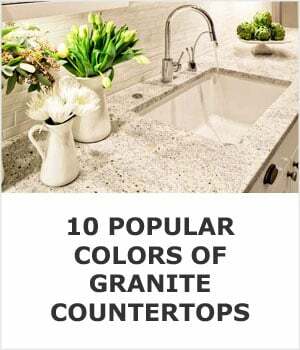 This is probably the first thing most people consider when choosing their countertop. 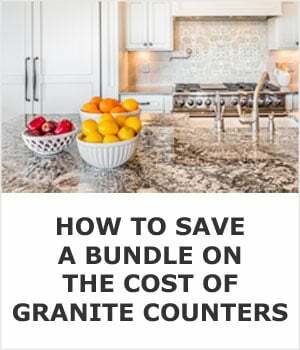 The final cost of countertops will depend on several factors, but generally, granite countertops cost $40-50 per square foot including installation. Quartz ranges from $50-75 per square foot installed. This difference can really add up if you have a big kitchen. At first glance, quartz may seem more environmentally friendly because it can be engineered and manufactured close to where it will be sold. The manufacturing plants also love to boast about how they use recycled materials as well as how they conserve water. However, both have to be quarried from somewhere–sometimes in the US, but usually abroad–so they’re both using the same energy and resources for that. Beyond this, quartz requires extra energy and resources since the stone is crushed and non-organic resins are added to basically glue the crushed pieces of stone together. Granite is literally formed by Mother Nature, cut out of the ground in big blocks, sawn into slabs, and then polished to a shiny surface. It doesn’t get more natural than that. You may have heard that granite is dangerous to use in countertops because it emits radon gas. Radon is a colorless and odorless radioactive gas that is produced by the breakdown of decaying uranium. Why do people think radon is in their countertop? Because it has trace amounts of radioactive materials in it–but so does the soil your home sits on and many other naturally occurring objects (like sand and stone). The fact is that there is such a minute amount of radioactive material that it poses no threat to people. Even if radon gas is released as the radioactive materials in the stone decay, the released gas mixes with the regular air and is diluted to such weak levels that it poses no threat to people. Of course, that’s not to say that radon gas isn’t a real problem–it can be, especially if you have cracks in your home’s foundation and holes in your home’s structure that are near the ground. However, radon from granite? There’s just not enough to be problematic. Very few shades of granite will fade when left in direct sunlight for extended periods of time. This is why stone slabs are often stored outdoors in direct sunlight. Quartz, however, fades noticeably in as little as a few weeks of direct sunlight, especially the darker colors. If you have a lot of direct sunlight in your kitchen, you should avoid it. Don’t be fooled by the 10 different options avaiable at Home Depot and Lowes. Head to your local stone yard or even better go to the whoesaler that sells slabs to the fabricator. They’re open to the public and will literally have hundreds of slabs for you to choose from. To make matters worse, most stone yards keep very few slabs of quartz in stock. They tend to just have samples for customers to view and choose from. This is a flat out terrible way to pick a countertop because samples don’t necessarily give you a true idea of how the finished product will look. 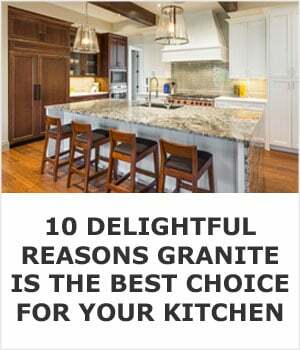 For granite, you’ll find lots of full slabs to choose from and you can see exactly how your countertops will look because you choose the exact slab and not just a sample. 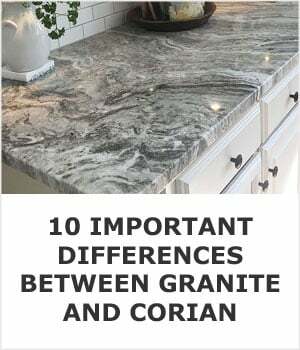 You’ll be able to compare the intricate patterns and subtle color differences before you ever have your countertops designed. One of the most popular brand of quartz is Silestone. 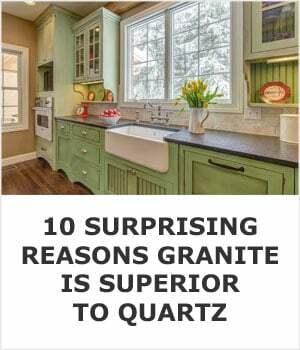 It does offer some benefits over granite that other brands of quartz do not. 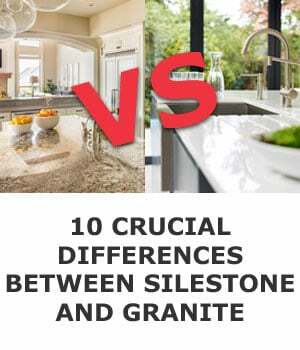 Here’s our guide to Silestone benefits, including a few that you’re probably not familiar with. Are quartz and granite the only options you’ll consider? Corian makes a decent product for kitchen countertops, but if you want to save as much money as possible without sacrificing quality have a look at modern laminates. If you’re goal isn’t to spend as little as possible on countertops and want to be sure you have a drop dead gorgeous kitchen work surface that’s easy to maintain, butcher block fits the bill. Depending on which species of wood you choose it costs about the same as stone but can be much more impressive looking.